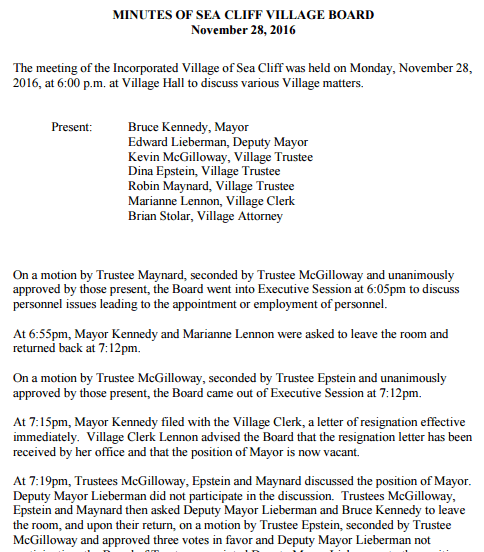 December 16, 2016 -- Several Sea Cliff residents spoke out at this past Monday’s Village Board meeting questioning the process new Mayor Ed Lieberman and the Trustees followed in appointing former Mayor Bruce Kennedy to the position of Village Administrator late last month. At a non-regularly scheduled meeting on November 28, Mr. Kennedy resigned as Mayor, deputy Mayor Ed Lieberman was appointed Mayor by the remaining three trustees, and then Mayor Lieberman appointed Mr. Kennedy Village Administrator. That position had become vacant in early November when then Village Administrator John Mirando resigned to accept a commissionership in the City of Long Beach. Mr. Kennedy had, as Mayor, taken on the Village Administrator’s responsibilities, without pay, for most of November. Mr. Lieberman opened his first public meeting as Mayor reading from a statement explaining how the role changes occurred. “Rather than immediately plugging this hole [left by Mr. Mirando’s departure] with a stop gap manager of administrator,” he said, “we began a process of seeking out candidates who could fit in the position." On November 28th, the board met to discuss the resumes it had received. The Mayor explained that Mr. Kennedy had expressed on the 28th the difficulty in devoting the time necessary for doing both the Mayor's and Administrator's jobs well,while also running a business. Mr. Kennedy, he explained, then tendered his resignation and subsequently informed the board that he would like to be considered as a candidate for the Administrator's post. Consistent with New York State law, Mr. Lieberman continued, the Trustees voted to appoint him to fill out the remainder of Mr. Kennedy’s term. “Trustees McGilloway, Epstein, and Maynard have given me that honor, which I graciously accepted,” he said. The new mayor then explained that he appointed Mr. McGilloway to serve as Deputy Mayor and “after a full discussion with the board” and with their “unanimous consent,” appointed Mr. Kennedy to serve as Village Administrator through April 3, 2017, when the terms for Mayor and two of the Trustees’ seats, currently held by Dina Epstein and the newly appointed Jeffrey Vitale, begin anew after the next election is held on March 21. During the public comment portion of the meeting, resident Claudia Moyne was the first to address the issue. Resident Jim Bernstein agreed and said that he believed that the process moved too quickly with Mr. Kennedy being appointed to the Administrator's post less than half an hour from when he resigned his position as Mayor. “There was a rush to judgment,” he said. He added that as a former reporter for Newsday he was very familiar with the New York State Open Meetings Law and expressed concern that the November 28 meeting was not consistent with what is required by the law. “Was this advertised?” he asked referring to whether public notice had been given. The calendar that appears on the Village website did not indicate that a Board of Trustees meeting was to be held that night. Resident Doug Barnaby, who said that he had been on the Board many years ago, reiterated Ms. Moyne’s point regarding transparency, and said that he believed it was more appropriate for someone who lives outside the village to hold that position - that it could create a conflict of interest. Resident Joe Krupinsky then stepped up to the lectern and addressed the Board. He said that he believed Mr. Kennedy had done a “great job as mayor and will do a good job as Village Administrator,” but, like those who spoke before him, stated that he was concerned about how the process had played out. “Where is the public notice,” he asked. Why couldn’t this have been spread out? Where was the transparency? Things could have been laid out so people could have input.” As for Mr. Lieberman’s appointment having been made at non-regularly scheduled meeting without an audience, he said that he believed the action was important and the manner in which it was done lacked the fanfare it deserved. “Where was the pomp and ceremony due the new Mayor?” he asked. He said that he believed under previous Mayors’ administrations there was greater openness. “There will be an election on March 21st,” the Mayor replied. “Our appointed Village Administrator left before his term was up. The public does not interview candidates,” Mr. Lieberman added. Ms. Moyne asked if there was a public notice for the executive session at which the appointment of Mr. Kennedy to the Village Administrator position was made. Mr. Lieberman responded that there was a meeting called and during that meeting the board voted to adjourn and go into executive session. “Was that meeting noticed?” Ms. Moyne pressed. Later, in response to a question from Mr. Bernstein, Village Clerk Marianne Lennon said that newspapers were notified and notices were put up at village hall and the library. It was unclear how far in advance of the meeting that was done. Resident Karin Barnaby asked if Mr. Kennedy as Mayor had appointed himself Village Administrator, or had the Board appointed him Village Administrator, and then he stepped down as Mayor. Village Attorney Brian Stolar responded that Mr. Kennedy had resigned first, and then the board appointed him Village Administrator. He continued that they had discussed with him first that he would be considered for the position. “There was no guarantee that he would get the position” when he resigned as Mayor, Mr. Stolar said. “He just stepped down as Mayor without his knowing that he would be village administrator. Do I have that right?” Ms. Barnaby asked. Resident Brendan Trudden pressed the issue and asked whether Mr. Kennedy knew he would get the position before he stepped down. Deputy Mayor McGilloway replied that the Board had received a number of resumes since Mr. Mirando’s departure and that they had been discussed by the board. Mr. Gilloway then explained how the appointment was made. Mayor Lieberman said the salary was what his predecessor received. “This is a municipality we’re running here - this is not a private company,” Mr. Trotter responded, asserting that the village should have negotiated a salary. Mayor Lieberman said that meeting times were moved up to an earlier time after having been held at 8 pm to make them more accessible to the public. He said that he believed the village has been transparent, and that he believed Mr. Kennedy is the best person for the job. “We as board, with the interests of this village paramount, believe that he is the best person for the job,” he said. Mr. McGilloway added that Mr. Kennedy was taking a risk in resigning as Mayor and accepting the Village Adminstrator position since the appointment runs through April 3 and an election for two trustees and mayor will be held two weeks prior to that. Trustee Dina Epstein said that she believed “that we did the best thing for the village. This does not benefit any of us on the board, it benefits the village because we did advertise, we did receive resumes, and what we received could not compare to what we knew was the best candidate that could possibly fill that village administrator position." A resident then asked when and where the job opening was posted and how many resumes were received. Ms. Barnaby stated that she believed that there is a "great distance" between the Village Government and some of the residents and that there is no oversight or checks and balances in Village Government preventing it from abusing its power. She advised that an Ethics Review Board be established. Mr. McGilloway said that the check on the Board are the voters who can exercise their power each Election Day in March. Resident John Laruccia then rose and congratulated Mr. Vitale for having been appointed to the vacant Village Board seat and Mr. Lieberman to the office of mayor. "I've never heard so much about transparencies since I had a slide projector," he joked. "We try to be transparent," replied the Mayor to the three dozen or so members of the audience. "This is always a learning process." "You're there for our checks and balances," he added. The new mayor concluded the meeting saying that he and the Trustees are always available to hear from residents - either in person, by phone, or email. ​"That's my promise," he said. 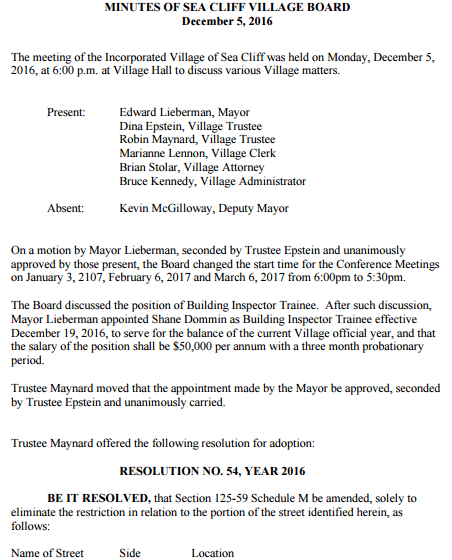 December 16, 2016 -- Mayor Ed Lieberman, who rose to that office after Bruce Kennedy resigned from that post late last month, appointed resident Jeffrey Vitale to fill his seat as a trustee until an election is held this coming March. A lifelong resident of Sea Cliff and alumnus of North Shore High School, Mr. Vitale, 32, graduated from Binghamton University. He currently works as a grant writer and FEMA representative for the Town of Oyster Bay, a position he was appointed to in 2014. Active in Republican Party politics, Mr. Vitale was tapped by the Nassau County Republican Committee to challenge Democratic Assemblyman Charles Lavine for the 13th Assembly District seat this past November. Mr. Lavine was re-elected. Mr. Vitale’s term will run through April 3, 2017. An election for his seat will be held on March 21.